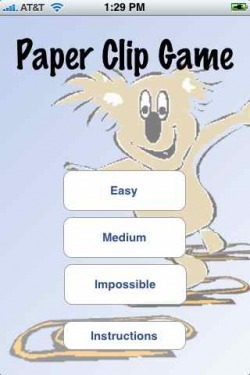 In this game you are competing against the computer in a puzzle game called Paper Clips. The objective is to make your opponent (the computer) have to pick up the last paper clip. The Game board starts off with four rows of paper clips. In the first/top row is 1 paper clip. On the second row is 3 paper clips. and the fourth and final row has 7 paper clips. In any move, you can remove as many paper clips as you like. But there is one catch. The clips you choose to remove must all reside within the same row. If there are 5 clips in the third row, you can remove 1, 2, 3, 4 or even all 5 paper clips in that third row, but you can't take some paper clips from row 3 and some paper clips from row 2 in the same move. This game is extremely catchy and fun to play. In the free lite version, you can only play the easy version, which has a limited amount of moves the computer knows about. So when you can consistently beat the computer, then please move up to the full version and help me pay my bills. In the full version, you get to choose which level you want to play. Easy, Medium, or Impossible. So as you get better and learn more moves, you want to graduate up to the impossible level, if you can beat the computer here, then you know all the moves. In an upcoming version, I plan to add two player support. Purchase this app on the iTune Store, just click the icon below.